If you are feeling stuck even the simplest tasks, let alone making your goals and dreams come true, troche can be rough. It is possible to get “unstuck” and change your entire experience of your day with a few simple actions. When you get your chi – your life force – moving forward and flowing easily, everything shifts and resistance begins to melt away. Here are 3 simple actions you can take RIGHT NOW to move stuck energy. All of these can be done every day as needed. Sing out loud! Feeling a little sheepish? Sing in the shower. Crank up the radio and sing in the car. Start singing a little ditty from childhood or even a catchy jingle from an ad. The act of singing brings movement and energy into your body. A jaunty song will perk you up and get the chi flowing in an easy way. The companion to singing is dancing. Not worrying about choreography or steps or anything. Just get up and shake it! Best if you can put on some music and get the flow going. Maybe other people in your household would like to dance with you – you won’t know unless you try it. Even if you are the only one in the mood – surely there is a place with no one looking that you can dance around a bit. Movement moves energy. When you are emotionally, mentally, energetically stuck – get up and move. A day full of “no” can be long and hard. Find a way to say YES to more situations, possibilities and experiences. They can be small things. 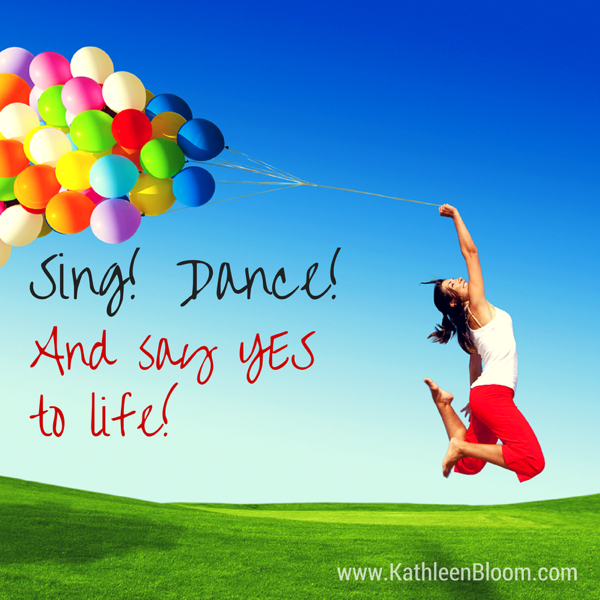 Saying YES gets your mindset and energy flowing and moving towards making things happen instead of closing down opportunities. Use discretion, of course, and increase the incidents when you say YES to love, life and adventures. Try one or even all of these today!